We figured we would jot down a few comments about the Thousand Trails Parks we have visited so far in the Northwest. These are our observations on attributes that caught our attention. We know we find it helpful to hear personal opinions on campgrounds, in addition to researching directories for key facts and amenities. Thousand Trails now sells their zone camping passes. You can buy 1-5 zones, so you can customize your purchase to those areas that interest you, up to a nationwide membership. Be sure to note that Jose & Jill Ferrer are the referring Thousand Trails members. Check it out at Thousand Trails Zone Camping Pass . A visit to one of the Thousand Trails parks will give you a chance to consider park locations, your personal travel plans, and then do the math on possible savings. it really depends on your own camping habits and preferences and geography of your expected travel plans. We visited three Thousand Trails Parks along the Oregon coast: Seaside, Pacific City and Whalers Rest (near Newport, Oregon). All three are nice parks near the beach, but don’t count on a great view of the ocean from any of them. Seaside is set the furthest inland of the three, but it is just a short drive or bike ride to get to the beach and the beachside town center. The park itself is laid out in two sections. One side has the store, lodge and tennis courts. The sites are adequate, the roads gravel. There is an indoor pool which seemed to be mostly used by kids. (I am not usually a fan of indoor pools, so you probably won’t hear me rave about them anywhere). WiFi is available in the lodge. The park was quiet and small enough for an easy walk about the place. We found it to be a good base for exploring northward to Astoria and southward to Cannon Beach. And the town of Seaside itself has a nice beach and shopping. What we had heard about Pacific City was that you either loved it or hated it. We had a positive experience. It is a pretty preserve, with sites set amidst a heavily wooded forest on a hillside overlooking the ocean. The trees block most ocean views except for a few sites. We found the mix of forest and oceanside location to be very pleasant. And we lucked out and found a very large site surrounded by trees and bushes with lots of birds and the little black rabbits that are found munching throughout the preserve. We even had a glimpse of the ocean from this site. The roads in this Thousand Trails Park are paved, but they do wind up the hillside in some pretty tight meanderings. The adult lodge is a small building that also houses the membership office. It has a computer connection, pool table, a TV and some games – and is located away from the family center, playground, store and pool (another indoor pool). This does make it a bit of a chore to get between the two facilities, as it requires a short drive or a long walk. In fact, strolling through the preserve is not easy since the sites are laid out in a configuration along the roads that wind up and down along the hillside. The family center seemed to be active, with weekend activities, food service and karaoke/entertainment. There are a few short nature trails in the park, and a path that leads to the beach. Or you can easily drive to the beach. Or drive on it if you have the right type of 4-wheel vehicle and know what you are doing. We took our 4×4 pick-up on the beach without a problem, but we did see three trucks get stuck and struggle for quite a while before breaking free and heading for higher paved terrain. Whalers Rest is a Thousand Trails Park just south of Newport. It is across route 101 from the ocean, with an easy walking path from the lower section of the campground to beach access. There are miles of beach to walk along. Within the park, you can easily stroll through the southern and northern sections of the preserve. While we were there, they held a walking club several weekday mornings. There is a clubhouse in each of the two sections of the park, and both have WiFi. The southern clubhouse is the place where the weekend entertainment and lunchtime grilling goes on. It also has an indoor pool, tennis courts, campfire, picnic tables and store. In the northern clubhouse, there is a dining area. Both clubhouses have Wifi and modem connections. Read more about the Oregon Coast . So far we have only visited one of the many Thousand Trails Parks in Washington state. Little Diamond in Washington is right over the Idaho border off Route 2. It was a convenient stopping place for us, and we spent a few days. It is a quiet park that seems to cater to a mix of seasonal and casual visitors. There is a picturesque walking trail that loops around the Little Diamond Lake on the property. They have a nice clubhouse that hosts some weekend activities. The park also has a small driving range, disc golf, a small outdoor pool, playground, horseshoes and rental paddle boats and row boats. California has a bunch of Thousand Trails Parks. We spent a few days in several as we traveled from Oregon to southern California. While we were in Morgan Hill, we really didn’t spend much time in the park. (Our stay was just after our Silverado burned to the ground, so we were a bit distracted). It appeared to be a nice park, with decent-sized sites and a large pool. It is convenient to San Jose. San Francisco is further north, and to the south is Monterey, CA. There is a store and a Lodge with games, books, TV and WiFi. Rancho Oso was the next one of the California Thousand Trails Parks that we visited. This is a very scenic location in the midst of Los Padres National Forest. 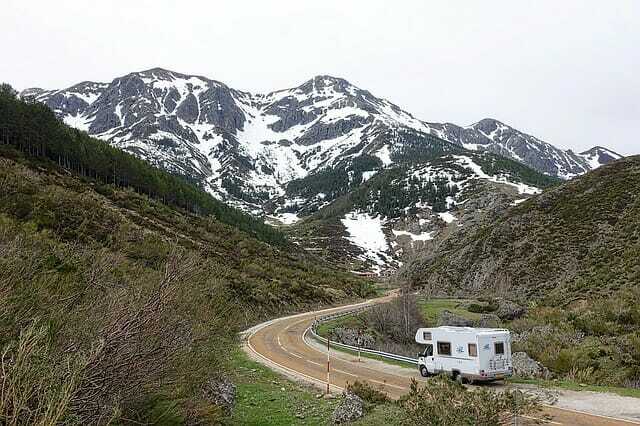 The RV sites are laid out in terraced rows and are surrounded by mountains. The park also offers a variety of rental lodging in cabins, trailers, park models and Conestoga wagons. Rancho Oso has horse stables and a few other farm animals. You can arrange for trail rides for an hour, two hours or longer. There is very nice pool, playground, ball field, volleyball, horseshoes, etc. Meals are served in a historic building now known as the Stone Lodge. There is a small chapel that is also used for recreational activities, an adult lodge and a store. When we were there, there was one computer modem which was also the shared phone line. Cell phone signals were tough to get in the park as well. There are a number of national park campgrounds and hiking trails in the area. We hiked the Aliso Canyon Trail and got some great views. Our next Thousand Trails Park was Soledad Canyon . This is a very large park. On one end is the Adult Lodge and a pool. On the other end is the larger Family Lodge and a beautiful large pool. Tennis courts, horseshoes and shuffle board courts are found in a various locations throughout the park. There are both shady sites and open sites. Those up the hill offer nice views of the surrounding mountainsides. Wilderness Lakes is a Thousand Trails Park on the eastern side of the greater Los Angeles area. It is a large park with a lot of sites, both open and shaded. There are canals running through the park, which are home to a variety of water fowl and some catfish for those inclined to fish. There are two pools, miniature golf, horseshoes, tennis, basketball, volleyball, a ball field, pool tables, and two lodges. In the sites nearest the adult lodge and tennis courts, you might be able to pick up Wifi from your rig. On the down side, these sites are nearest to the cattle feeding facility next door, so the air may smell of cows, depending on how the wind blows. Consider the sites further back in the park. As housing development continues in the surrounding area, it is difficult to relate to the “wilderness” or the “lakes” aspect of the park. But it is a very popular park with a location that is convenient for seeing the sights in the Los Angeles area. Palm Springs Thousand Trails Park is actually located between Palm Desert and Indio, right off route 10. It is filled with impressive, very tall palm trees. It has a pool, store, and a couple lodges. Is seems to offer a pretty full schedule of activities. Many of the sites are narrow and you may have to navigate one or more of the palms. It is a popular preserve in the Thousand Trails Parks system, conveniently located for touring the Palm Springs area. The Pio PicoThousand Trails Park is located southeast of San Diego. It is close enough for about a 30 minute drive to San Diego, and about a 5-10 minute drive from East Lake, a nice suburban community with stores and restaurants. Jamul is a short distance way in the other direction – we only ventured as far as the jamul Post Office to pick up our General Delivery mail. The park itself is divided into a North and South section, referring to the land on either side of Otay Lakes Road. The South section has full water, electric and sewer connections. The North side of the park has only electric and water. The Thousand Trails Park rangers orchestrate a Crossover program on a daily basis. Campers on the North side who prefer a sewer connection can put themselves on a waitlist, which is used as a first come, first served opportunity to move to the South section. The South section has the main Activity Center, Youth Center, Family and Adult Pools, mini-golf and Trading Post store. There is an Adult Center on the North side with adequate WiFi/computer ports, game tables and a TV room. Scattered throughout the park are a pickleball court, basketball court, volleyball, shuffleoard and horseshoes. The Pio Pico park is set amidst hills that make a cell phone signal difficult. The patio outside the Youth Center seemed to be the place to use your cell phone – with a view of the family pool. We have not yet spent a lot of time in Pio Pico Thousand Trails Park. We have used their temporary RV storage lot to store our motorhome over the holidays. While staying at Pio Pico, we have attended their Casino Night and some square dance lessons – a first for us and very much enjoyed!. And we made some day trips into San Diego and Tijuana. For more info, see our comments on the Thousand Trails Parks in Hershey PA and Kenisee Lakes OH, Orlando, Florida, and Verde Valley AZ.